The mythical town of Timbuctu was and still is difficult to get to! 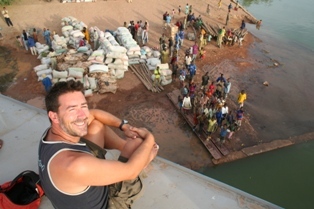 There are two ways – by boat down the river Niger or in a jeep over the desert. We chose the former. The options include travelling by public pinasse, private pinasse or by the commercial Comanav boat. The first option means 3 or more days balanced on a sack of rice or millet and enduring lengthy stops at all the villages. Not an option! Private pinasses are ridiculously expensive – the dual economy is live and kicking here. 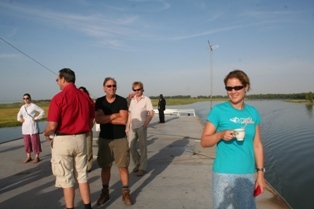 We were lucky enough that the Comanav large passenger and cargo boat was heading down river on a date that suited us. We armed ourselves with first class tickets (49,000 CFA or 150 euro) and took our places in our bunk room for the 2 days. 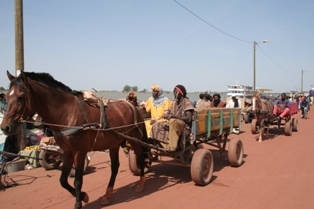 This also enabled us to hold the advances of all the local guides at arms length – they are extremely numerous and persistent in Mopti! 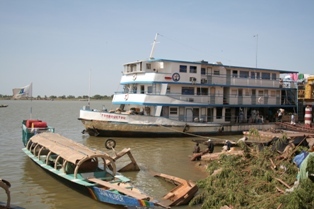 On our travels over the past week or so we had gathered a number of fellow travellers – so together with Lucia from Switwerland, George and Roger from Canada, Casper and Jasper (I joke not) from Denmark, and 4 Americans we set off in a timely manner from the dock at Mopti. 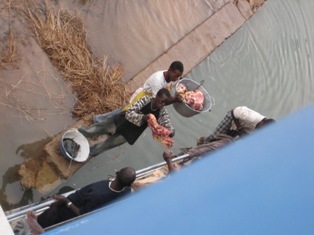 The boat had been loaded to the gills at Mopti with all manner of goods including about 20 sheep who made the journey in rice sacks. Many people made their sleeping spaces on deck, tea was being made everywhere on small charbon stoves, and African tunes blared out into the night. 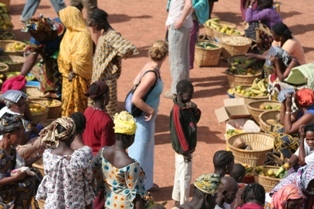 Among the goods on the lowest deck; enterprising women had set up a transient market. We found our way to the roof and enjoyed the night breeze and a few gin and tonics courtesy of Jake the American. Fishermen in small pinasses communicated frantically by torchlight with the captain to protect their fishing nets – never have we seen a large boat make its way around countless small nets! After a relatively good night’s sleep, we awoke early at sunrise and enjoyed the sight of the sun rising over the riverside landscape. 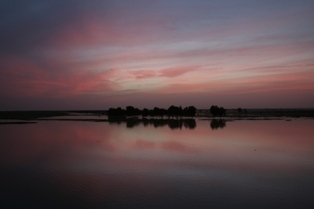 The NIger is a majestic river, winding its way through an arrid landscape. 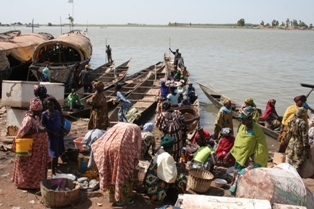 Many villages line its banks – Bozo fishing communities and Fulani herders. 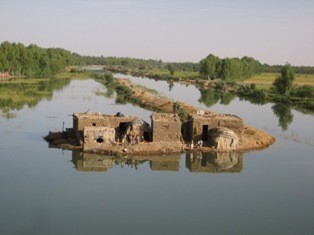 These people rely on the river for their livelihood and transport – roads are non existent. We ate on board, meals varied from a piece of bread for breakfast (carefully doled out; one piece each!) to nice lunch and dinner. The rest of the daytime was passed easily, lazing on the roof or seeking shelter from the sun when it got too hot. We made several stops for loading cargo, most notably at a town called Niafunké. The boat docked at what looked like an impossibly shallow and broken down bank, to a waiting crowd of locals – tradesmen and lots of excited children. No sooner had the gangplank gone down had the ladies on board set up an impromptu market on the dock. Many sacks of rice, millet and cotton were loaded on, not to mention a huge hunk of raw meat passed straight to the kitchen! The process took over 2 hours and we were off again. Cathal surveying the cargo from the roof! Dinner coming on board – may turn some vegetarian! That night, Cathal was lucky enough to see a bunch of hippos on the bank! The night sky was impressive too – no electricity around to interfere. 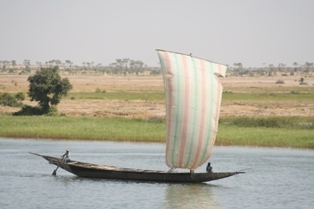 We finished the journey on Saturday morning (having left Thursday night), travelling up a canal from Korioumé to the new port of Timbuctu, 6km outside the town. We all hopped into the back of a jeep and headed off to the town. The boat trip was a fantastic experience, one of Cathal’s favorite so far in our travels so far! Timbucktu loks great. Will have to persuade Sean…. …but who knows?